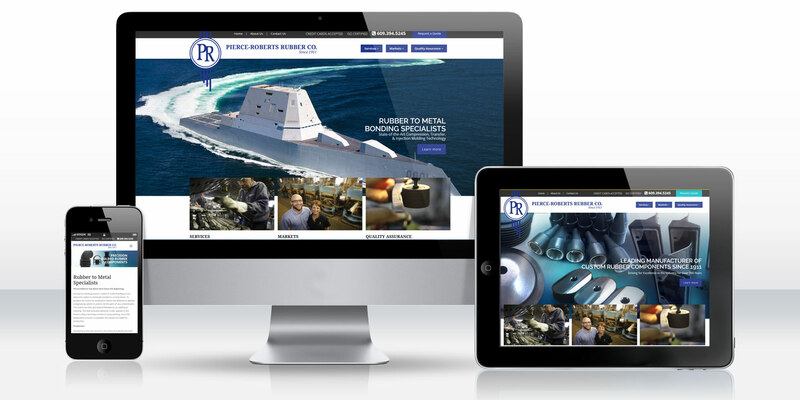 Pierce-Roberts puts a fresh new face on its time-tested custom rubber parts manufacturing with this responsive website design by DDA. Visit the Pierce-Roberts Rubber Company website. Pierce-Roberts Rubber Company, a manufacturer of high quality custom rubber parts since 1911, sought a refreshed, innovative, and responsive website to complement its superior manufacturing and production services, as well as its established marketing and branding goals. Though the website contained the necessary content for search engine optimization, it was still lacking in terms of design and responsiveness. In 2017, Pierce-Roberts decided that it was the right time to redevelop their website by utilizing its existing content and implementing a contemporary, attractive user interface. The new Pierce-Roberts Rubber Company website would consist of designing a streamlined, top of the line website dedicated to showcasing its substantial line of services and products, while also maintaining the company’s branding. Through the use of high quality imagery and concise textual information, the website would need to exhibit Pierce-Roberts’ exceptional knowledge in the industry. All content would need to be reproduced in the new design in order to preserve the existing SEO value of the site. By using Pierce-Roberts’ established color schemes and aesthetic photographs of actual products, DDA will be able to demonstrate the company’s goals through a cutting-edge, user-friendly platform designed to educate consumers and promote product offerings. Dynamic Digital Advertising delivered a refreshed, intuitive website to Pierce Roberts Rubber Company, highlighting the company’s wide range of product and service offerings in the rubber-making industry. The responsive website includes a Request a Quote form and the company’s ISO certification on every page, accentuating the importance of putting Pierce Robert’s customers’ first. Pierce-Roberts was beyond delighted to introduce the new responsive website to their colleagues and customers, even asking DDA to publish a press release for the occasion.